Although as of late 2012 I continue to use medium format film for all serious photographic undertakings, a supplementary digital camera plays an important role in my work. The size of my supplementary digital cameras has been shrinking over the years—from the Nikon D70s (2004) to the Panasonic LX2 (2006) to the Canon S95 (2010)—because while I require a minimum acceptable image quality and usability (RAW capture and convenient control of the main shooting parameters), camera size is of a paramount importance to me, too. During the past two years my main digital camera has been the Canon S95, and it has served me exceedingly well. Technological progress, however, marches on, and we can reasonably expect today's cameras to bring a host of improvements. At least on paper, the Sony RX100 seems to be a significant advancement—it boasts a significantly larger sensor and a number of attractive features in a package that is almost as small as that of the most compact digital cameras. As I am transitioning to the RX100 from happily using the Canon S95, I am naturally inclined to evaluate the former from the standpoint of my extensive experience with the latter. Contrary to my expectations, the Sony RX100 is a clear step backwards vis–à–vis the Canon S95 in terms of ergonomics and handling. First, the lens is huge in relation to the size of the body and watching it appearing and disappearing feels quite momentous, or even dramatic. While it is perfectly understandable why the lens has to be so large—consider the size of the sensor—the unwelcome consequence is that start–up and shut–down time is impedingly long. (Witnessing such an imposing action each time I switch the camera on and off leads me to ask how reliable mechanics of the lens will be in the longer run). This being said, once the lens has made an entrance operation of the camera is very snappy. Second, the buttons of the RX100 are significantly smaller than those of the S95 (the ones on the side of the camera actually seem to be falling off the edge), and their hesitant tactile feedback makes you pay much more attention to the camera than you should. Third, although the RX100 is reported to be only a wee bit larger than the S95, in person it actually is noticeably bigger and heavier than you would guess after looking at the comparison pictures. Fourth, the camera body is metal and does not have any coating: while it might appear beautiful in the pictures, in reality it is quite slippery and awfully hungry for fingerprints and smudges. The RX100 boasts a control ring around the lens barrel that can perform a number of functions. Unlike most other cameras that have the same feature, the ring of the RX100 does not have click detents and rotates continuously. Whether this is a blessing or a curse will depend on what functions you want the ring to perform: if you are working slowly, continuous rotating works well for manual focusing and zoom fine–tuning; if, however, you use the ring to set such parameters as aperture, shutter speed or ISO, then you will find operation of the ring quite fiddly. All things considered, I would certainly prefer it had stop–clicks. On a camera without a viewfinder, LCD screen is of a fundamental importance. As far as the RX100 goes, we have good news and bad news. On the upside, the screen boasts VGA resolution and images look sharp and crispy. On the downside, however, the screen, just like the camera itself, is hungry for fingerprints and smudges; furthermore, it is quite difficult to clean. This may not be a problem in dim light, but in bright sunlight contrast of the screen is significantly reduced despite the use of the "WhiteMagic" technology. And sadly, this is not the end of bad news: the screen is made of a material that scratches very easily. I made it a point not to put the camera together with other objects, and yet the screen of my RX100 already shows numerous tiny scratches. The combination of smudges and scratches in bright sunlight instantly kills the magic—to the point that you cannot see anything on the screen unless you shade it with your hand. I expect my cameras to follow my rhythm, not the other way around, and I am not going to fiddle with protective covers or tiptoe around the camera to avoid scratching the screen, so to me this is a major drawback. In my view, this is a fundamental blunder on part of Sony. Live histogram is too small in my book and its only saving grace is that resolution of the screen is high and so it looks crispy; further, live histogram is in the shape of luminance histogram only. Will we ever get large, transparent, RGB live histograms on all our cameras? Battery life is very good and in line with what one would expect from a compact camera: without too much chimping and flash use, on the average I get about 250 images with a fully charged battery; quite impressively, you can still take a dozen shots when battery life indication turns to red. What I really like is that battery life indication appears very consistent with the actual charge left: unlike so many compact cameras, the battery is not nearly dead after the first bar disappears. I have bought two spare batteries and feel comfortably covered for a full day of intensive shooting. Speaking of charging batteries, it has been mentioned a thousand times and Sony have clearly goofed here: the camera comes without a battery charger and batteries can be charged in–camera only. In–camera charging simply does not work for me (and, I reckon, most serious photographers): you cannot use the camera while a battery is being charged, and I do not like the idea of sticking a cable into the camera each and every time I need to charge a battery. I solved the problem by buying an unnamed third–party charger that costs only seven dollars and works like a charm. Autofocus is surprisingly fast for a compact camera and after several weeks of use I have no complaints about it whatsoever. This seems to have been achieved partly by making the camera constantly "zone pre–focus" whenever it is turned on: for instance, if you turn the camera from an object at infinity to a close subject, the camera will pre–focus on the close subject without you pressing any buttons; when you press the shutter release button to focus the lens only needs to fine–tune focus in the already pre–focused zone. This does not seem to impede camera operation in any way, so this method is very much welcome. Exposure seems spot on most of the time: whereas with the Canon S95 I constantly fiddled with exposure compensation to preserve highlight detail, with the RX100 I have to adjust exposure much more seldom. This certainly feels like a relief. Menus are very well sorted and easy to navigate. I particularly like that, unlike other cameras that I have used, there is no vertical scrolling. The RX100 passed my use–without–a–manual test, albeit not exactly with flying colours: there are several items in the menus that will require reading the manual. It should also be mentioned that the camera is very customisable and implementation of the Function button is well thought out; as a result, once you set the camera the way you intend to usually use it you will not need to delve into menus all that often. As far as field use goes, the RX100 has some notable pluses and significant minuses. Overall, it feels more fiddly and less fun than the Canon S95. Nonetheless, faster autofocus, more accurate exposure and higher resolution screen in part make up for the extra efforts one has to put into using the camera. RAW files are not raw? This raises the philosophical question of whether this is a good thing. On the one hand, we want to get raw data from the sensor to optimise it as we see fit and achieve the results that reflect our artistic vision best. From this perspective, the lack of true RAW is a disaster. On the other hand, however, vignetting, chromatic aberration and distortion are abnormalities that seldom serve as a means of creative expression (with the exception of vignetting, perhaps). We usually remove these aberrations in RAW converter software of our choice, and, given that Sony fully understand properties of the lens, one could argue that third party software would deal with the aberrations less perfectly than the camera. From this standpoint, the in–camera corrections are a blessing. I reckon that those who prefer having the utmost control over the data collected by the sensor will find this disheartening, and those who only concern themselves with the aspects of RAW conversion that have direct implications for creative expression will consider this issue inconsequential. At any rate, what is done is done, and I personally find that seeing almost no vignetting, chromatic aberration or distortion is quite relieving; not having to deal with the aberrations in post processing saves time, too. With this being said, though, can it be a free lunch? I doubt so. The consequences of automatic corrections have to surface somewhere—and that somewhere most likely is image sharpness, which is more than likely to be impacted negatively. As it turns out, the culprit is not Sony—it is Adobe. RAW files of the RX100 actually contain original uncorrected data and all pixel data is intact; at the same, Sony also include in RAW files camera lens profile, so that RAW converting software can use it to deliver results that are corrected for the above mentioned aberrations (and, quite possibly, other things such as noise, etc.). The issue with Adobe Lightroom 4 is that it automatically applies lens profile imbedded in RAW files when viewing and converting images, thus by default delivering corrected results. Quite annoyingly, this behaviour cannot be changed—even if you switch the lens correction panel off. Apple Aperture is reported to do the same. Some software, however—DxO is one example—allows switching lens correction off and can show uncorrected results, so that you can easily toggle between "before" and "after" images and analyse original RAW data. Additional discussion can be found here. As discussed above, vignetting, chromatic aberration and distortion are apparently corrected for in–camera even when you shoot in RAW format. As a result, we have no way to ascertain sharpness of the lens itself and are left to evaluate resulting image sharpness instead. As you can see, the lens is realistically fast only at the wide end. 28mm. In the centre, there is a bit of softness at f/1.8; sharpness improves a little as you stop the lens down and peaks at f/5.6; diffraction becomes visible at f/8.0 and is very noticeable at f/11. The same story repeats in the corners, with the difference that there is more softness than in the centre. Overall optimal aperture: f/5.6. 35mm. In the centre, images are noticeably soft at f/2.8; sharpness improves considerably and peaks at f/4; diffraction is slightly noticeable at f/5.6 and becomes increasingly pronounced as the lens is being stopped down. The same story repeats in the corners (but there is more softness). Overall optimal aperture: f/4. 50mm. In the centre, sharpness is very good right from f/3.2 and peaks at f/5.6; diffraction becomes noticeable at f/8 and is obvious at f/11. Corners are very soft at f/3.2, and corner sharpness noticeably improves by f/5.6; sharpness peaks at f/8 and diffraction becomes visible at f/11. Overall optimal aperture: f/8. 70mm. 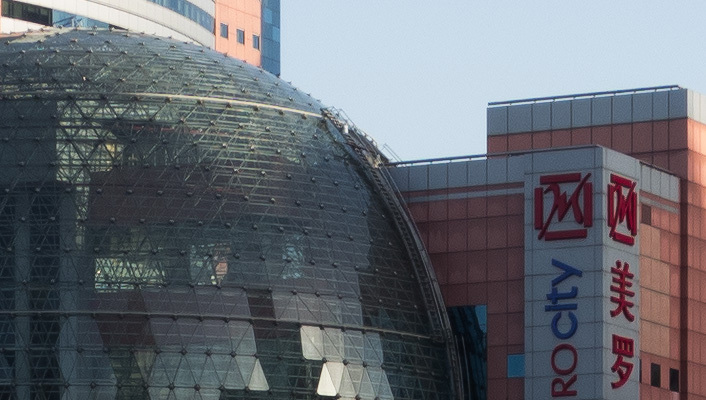 In the centre, sharpness is quite good right from f/4, peaks at f/5.6, and diffraction becomes noticeable at f/8. Corners are very soft wide open, sharpness improves at f/5.6 (but is still weak) and peaks at f/8. Overall optimal aperture: f/8. 100mm. In the centre, sharpness peaks right at f/4.9, and diffraction becomes noticeable at f/8. Corners are very soft wide–open; sharpness gradually improves as the lens is being stopped down and peaks at f/11. Overall optimal aperture: f/8. All things considered, the camera can deliver very intricate detail that is plentiful for large prints—if you use the ideal settings, that is. If you deviate from the optimal apertures, though, the high megapixel count of the camera will be wasted. To summarise the above, here is the executive summary for getting the best results in terms of image sharpness at the base ISO setting: in low light, shoot at 28mm (equivalent) and f/1.8—and do not be shy to get closer to your subject! Otherwise, f/5.6 is the optimal aperture at the wide end and f/8 is the best option at the longer end. In all instances, avoid using f/11. To analyse high ISO performance of the RX100, I examined test images on–screen at 100% magnification and closely studied both test and real–life prints (RAW images were processed in Lightroom 4 and printed without downsizing at 360dpi, which produced fairly large prints, 39cm by 26cm). Generally, high ISO performance of the RX100 is in line with what one would expect from a state–of–the–art 20MP one–inch sensor. Noise is visible at 100% magnification right at the base ISO setting, but it is far from objectionable, easy to deal with and, if anything, has the appearance of texture rather than noise. As expected, it becomes increasingly noticeable as you go up the ISO ladder, and at ISO800 noise begins to be visible in prints at close examination (or, depending on your noise reduction preferences, subtle detail starts being smeared). Nonetheless, large prints still look mightily good and you would not notice any problems with noise or subtle detail unless you juxtapose them with prints of identical images shot at ISO125. At ISO1600 noise becomes very pronounced at 100% magnification, and one has to carefully balance noise reduction and retaining fine detail to get images that are both relatively clean and detailed. Although this is obvious in large test prints, if carefully processed, real–life prints show plentiful detail and look perfectly fine. It is at ISO3200 where things start to fall apart, both at 100% magnification and in prints; nonetheless, this ISO setting can still work for smaller prints where fine detail is of secondary importance. Lastly, ISO6400 is quite a bit of a stretch in my book, but, with mindful post–processing, it can be used when what you have in mind is small prints and the Web. Executive summary? I set the higher ISO limit of the Auto ISO function of my RX100 at 1600*. Unfortunately, ISO of the camera can be set in full stops only, otherwise I would likely push it a third of a stop further. With the Canon S95, the upper Auto ISO limit that I used was ISO640; now the RX100 allows to comfortably raise the bar to ISO1600 and get better results. Not too bad at all, if you ask me! Image quality aspects other than the ones mentioned above are very good for a camera and sensor of this size. In particular, dynamic range does not pose any problems, highlight headroom is sufficient when you shoot RAW, and colour reproduction is pleasant straight out of camera most of the time. Being a 20MP camera, the RX100 produces files of fairly large size, especially if you shoot in the RAW + JPG format. To make sure the camera operates as fast as possible and is not bogged down by long write times, you will need to get the fastest SD cards available. In my view, the real benefit of having 20 megapixels is not the resolution per se, but rather the ability to down sample images (for some of you it may be the ability to crop). If 10–12MP is enough for your needs—and it is enough for most purposes we tend to use compact cameras for—then down sampling allows to get stunning image quality when shooting parameters are optimal; if shooting parameters are not ideal, then down sampling affords decreasing noise and/or improving image sharpness. Magnifying images in playback mode is slow and jerky. As has already been mentioned, ISO is adjustable in full stops only. To make it worse, implementation of the Auto ISO function is rather crude: you can set lower and higher ISO limit, but there is no way to control or influence shutter speed whatsoever. The UP side of the Control Wheel at the back of the camera can only be used to switch between different display views and cannot be assigned to perform any other functions. Personally, I only need one view, the one that shows aperture, shutter speed, exposure compensation and ISO setting, so in the shooting mode this side of the Control Wheel sits there totally unused. If Sony intend to produce a camera truly intended for serious photographers, they might want to consider getting rid of the junk functions that, despite their designation, perform only one task: getting in the way. For example, the Smile/Face detect function has the following options: On, On: Big Smile, On: Normal Smile, On: Slight Smile, and On (Registered Faces). WTF? If I seem to be overly critical of the RX100, it is for two reasons. First, I consider it a serious camera suitable for serious work and, consequently, examined its performance with the high expectations I usually have for serious photographic tools. It is meant as a compliment to the RX100, because placing it in the "point–and–shoot" category would repudiate its competence and strip it off of the aspiration to be a serious photographer's companion. And second, my intention was to make other photographers aware of any and all issues that may be of consequence for their photographic work. 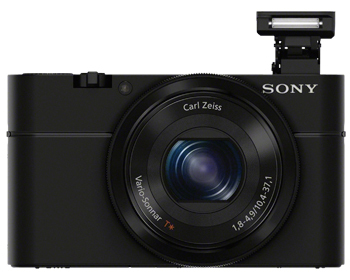 With this clarified, the Sony RX100 clearly is a ground–breaking camera. It has significantly pushed the envelop of what a truly pocketable digital camera can do in almost every respect. Furthermore, it offers a unique package where the combination of camera and sensor size makes the whole greater than the sum of its parts. To put it simply, there is no other pocketable camera on the market today that overall is as compelling as the RX100. But of course, the RX100 is not perfect. Despite my complaints here and there, though, there is not a single aspect that has been executed decisively poorly. If you consider that it has almost become a norm to unashamedly release cameras with numerous and/or fundamental flaws to the market, then Sony have done exceedingly well for a product that establishes a new category of cameras. Indeed, most of the drawbacks of the RX100 are minor and, after using the camera for a couple of months, only three of them are real in my book: small, fiddly buttons, slow mechanical operation of the lens that results in long start–up and shut–down time, and the rather narrow margin where image quality is truly superb. While the first issue can be easily addressed in the next version of the camera, the last two are more difficult to deal with because of what the size of the senor entails. 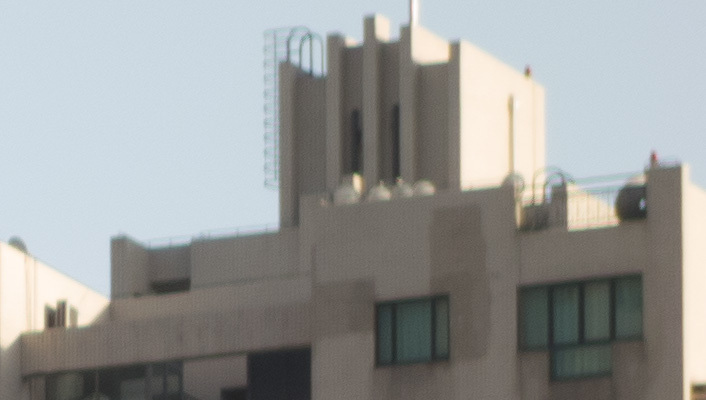 Here, I would certainly give up a bit of zoom range to have better image quality and faster lens operation. Or better yet, give me an RX200 with a 35mm (equivalent) f/2 pancake lens of great quality that is smaller than the collapsed lens of the RX100. Now that would really be something else! In summary, the Sony RX100 is a solid keeper and truly worthwhile replacement for my Canon S95; suffice it to say that I have not taken a single photograph with the latter after the former made its way into my pocket. I hope that Sony will continue in the right direction with the RX200, and, meanwhile, will be making the most use of my RX100. *Beware that my friends think I am quite picky, so you should try shooting at ISO3200 to see for yourself if you are happy with the results.